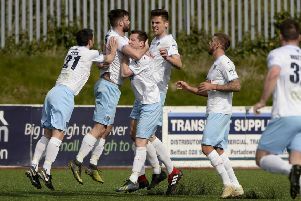 Goals by Allan Jenkins and Conor McCloskey in the closing moments of each half handed Ballymena United a first League Cup victory in club history to break Carrick Rangers hopes and hearts with a 2-0 success. Jenkins, who will be out of contract this summer, sent United into the changing rooms at half-time flying high with what could prove his final key contribution in Ballymena blue and McCloskey capped the Seaview showpiece with a fine injury-time finish against his former club. Leroy Millar proved a bright spark during Ballymena’s bright start, with some teasing play along the left lacking a finishing touch from, respectively, Johnny McMurray and Jenkins. Carrick came back into contention after 20 minutes with an attack kicked off by Steven McCullough that featured persistent play inside the penalty area from Daniel Kelly before TJ Murray smashed the loose ball over the crossbar. Brian Neeson spent the week leading up to kick-off recovering from a rib injury and Ballymena attempted to test the goalkeeper across the initial stages. One drive from distance from McMurray was pushed over the bar by Neeson. An outswinging corner-kick from Ballymena’s major pre-match injury doubt, Tony Kane, dropped for Millar to attack without success before McMurray smashed wide with a low angled drive. Martin Murray’s long-range shot marked a first test of the fixture for Ballymena goalkeeper Ross Glendinning but comfortable stop. Cathair Friel’s header over the crossbar suggested continued Ballymena pressure and the opening goal eventually arrived in the final moments of the first half. Slick play along the right helped Willie Faulkner skip past three Carrick players and Jenkins burst into the box to meet the cross on the run and break the deadlock. McCullough stepped forward in the second half with a free-kick strike from a promising position that dropped over the target. The livewire McMurray came close to increasing the Ballymena lead as Friel found space to feed over the ball from the left and the forward stabbed the cross goalwards then, following Neeson’s initial stop, blasted the rebound the wrong side of the post. Friel’s influence increased as play progressed and he waltzed past McCullough before picking out McMurray, who scooped the shot over the bar. Caolan Loughran then headed over on the run off a Kane cross as Ballymena stepped up the search for a second goal. Two sights of goal arrived in quick succession after 76 minutes. Kane and Neeson confirmed the value in each player’s club waiting until the last moment before making a final call on selection as the Ballymena player’s free-kick appeared set for the top corner before the Carrick goalkeeper rose to claw it away. From the subsequent corner by Kane the ball bounced off McMurray and dropped into the danger area but Jenkins could only bundle it over the bar. Carrick substitute Adam Salley was introduced to add a late attacking threat and came close to an equaliser on 80 minutes but his header looped high after a McCullough delivery was knocked down by McNally. Glendinning then scrambled down low to prevent Carrick substitute Chris Morrow from making his mark moments after stepping off the sidelines. McCloskey wrapped up victory with a spectacular drive two minutes into injury-time - and 10 after joining play - as the former Carrick Rangers winger blasted the ball into the top corner with a slick angled strike. BALLYMENA UNITED: Ross Glendinning, Tony Kane, Kyle Owens, Allan Jenkins, Willie Faulkner, Cathair Friel, Jim Ervin, Leroy Millar, Johnny McMurray, Fra McCaffrey, Caolan Loughran. Subs: Gary Thompson (Kane, 90), Darren Henderson (McMurray, 93), Conor McCloskey (McCaffrey, 81), Tim Allen, Adam McCracken. CARRICK RANGERS: Brian Neeson, Lee Chapman, Steven McCullough, Mark Surgenor, Paddy McNally, Mark Clarke, Eamon McAllister, TJ Murray, Daniel Kelly, Martin Murray, Sean Noble. Subs: Adam Salley (Clarke, 61), Glenn Taggart, Nathan McConnell (McAllister, 80), Yvan Imbert, Chris Morrow (M.Murray, 84).